The name Heydebreck or Blechhammer South is usually used to indicate one of the two chemical plants ( the other was just a short distance away at Blechhammer North) constructed by Nazi industrialists, and in particular I.G. Farben, near to the present-day settlement of Stare Koźle (Cosel), where they could exploit the pool of labour supplied by prisoners of war and forced workers. The principal objective of the I.G Farben company was to create chemical plants capable of producing a new type of synthetic fuel from lignite to be used as a propellant for the vehicles of the German Army. Around two thousand British prisoners of war who had arrived in Poland from several Italian prisoner of war camps during the summer of 1943 were used alongside other workers to build the industrial plant at Heydebreck. Initially two Bau-und Arbeitsbataillon were set up at Heydebreck, that is B.A.B 20 (later renamed E 794) and B.A.B. 40 (which was amalgamated with B.A.B 20 in the March of 1943), with a total of 1,200 British prisoners of war. To these must be added other British prisoners of war held in the Arbeitskommando E 711, E 711A (the barracks of which were completely destroyed during an American bombing raid), and E 769. 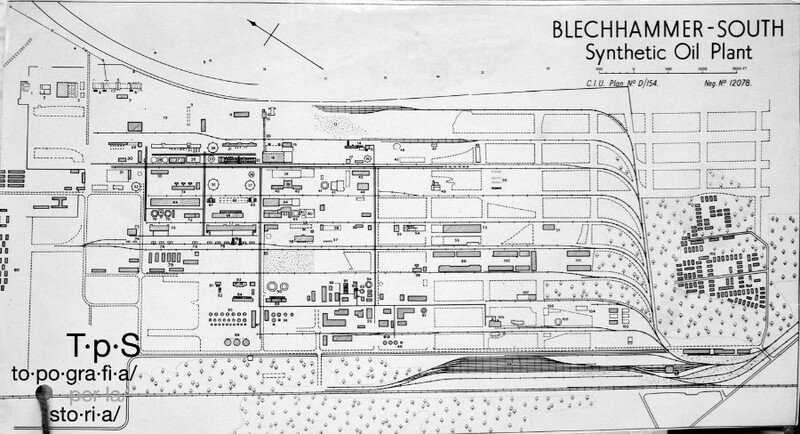 Thanks to the maps drawn by several British prisoners of war it has been possible to locate the work camps situated inside the Heydebreck industrial complex with a certain degree of accuracy. In this first map, camp B.A.B. 20 is shown to be located right next to the industrial buildings, whilst work detachment E 711 is situated immediately outside the industrial zone. In addition, the diagram indicates the presence of other camps. 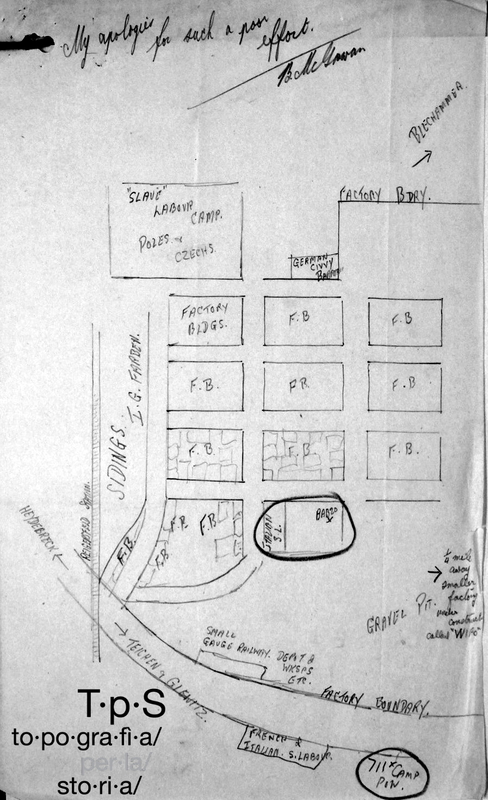 In the top left corner, in the direction of Blechhammer, there is a large camp for “Polish and Czech slave labour” and another smaller area is set aside for “barracks for German civilians”. Next to the rectangle indicating B.A.B. 20 there is a smaller one labelled “Italian S.L.” (probably Slave Labourers), and lower down, next to the British camp E 711, there appears to have been a further zone for “French and Italian slave labour”. Nonetheless, according to several testimonies,2 the conditions under which these men were working would not have differed greatly from those under which the prisoners of war laboured. In particular, it would have been extremely difficult for them to leave Germany. This probably led the creator of the map to use the term “Italian slave workers”. 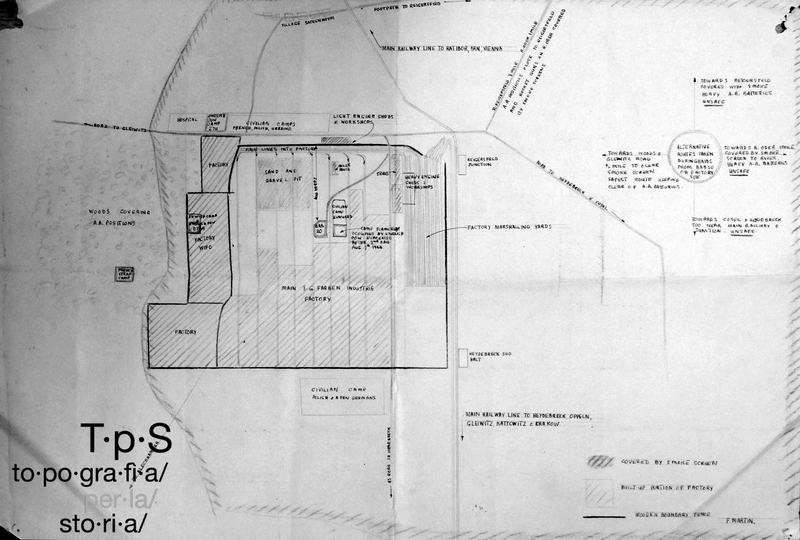 Other useful indications regarding the location of diverse workers' camps present on the site of the Heydebreck chemical plant can be found on the map drawn by a second British prisoner of war. On this map there is no indication of a camp for Italian workers. According to other sources, another hundred or so British prisoners of war were sent to Heydebreck from work detachment E 715 which was located next to the I.G. Farben plant at Auschwitz-Buna. 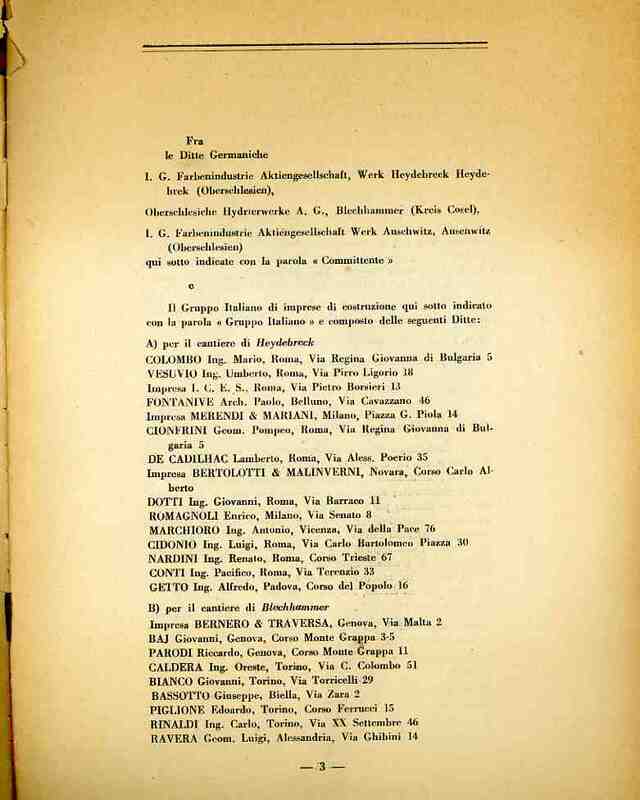 See the Contratto per l'esecuzione dei lavori di costruzione in partecipazione con imprese germaniche, nei cantieri di Heydebreck, Blechhammer e Auschwitz, 1942, Roma Tipografia del Gianicolo. Cesare Bermani, Sergio Bologna, Brunello Mantelli: Proletarier der “Achse.” Sozialgeschichte der italienischen Fremdarbeit in NS-Deutschland 1937 bis 1943 (Berlin: Akademie, 1997). The WIFO was a Society for Economic Research of the Reich which operated in strict collaboration with I.G. Farben.